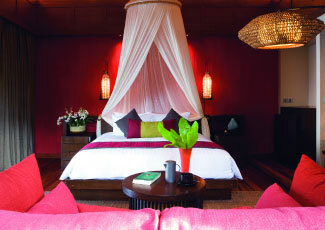 Anantara Rasananda Koh Phangan Villa Resort & Spa is a luxurious villa located in Thang Nai Pan Noi Beach. Where white sand beach stretches before your villa and pampering spa treatments come infused with tradition. 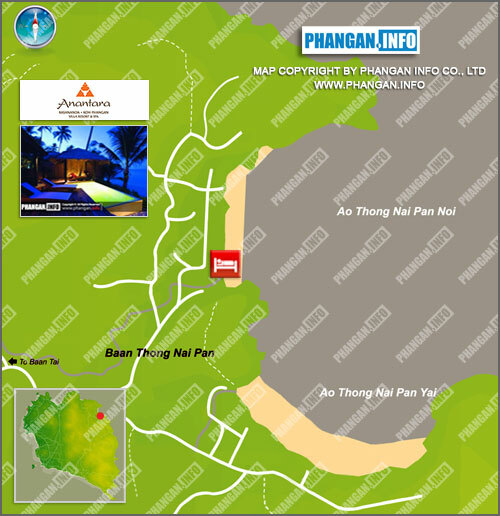 Set along the pristine sands of Thong Nai Pan Noi Beach on the northeast coast of beautiful Koh Phangan, one of the three islands in the Samui archipelago, Anantara Rasananda Koh Phangan Villa Resort & Spa is easily accessible from Koh Samui, Koh Tao, Surat Thani, and Chumporn. Located on the 2nd floor, expansive terraces boast a tropical garden and sea panorama. Spacious yet intimate, 100 square metres of Thai inspired living space is made even more luxurious by a personal outdoor plunge pool. Step onto the terrace and admire your private garden in full bloom. Enclosed by high walls with an ancient wooden gate, 130 square metres of beautiful indoor and outdoor space combines contemporary aesthetics with graceful Thai charm. Located on the resortâ€™s upper level, a sweeping terrace wraps around each 100 square metre beachfront suite to reveal a panoramic ocean vista and glorious sunrises, while lazy days can be spent by your private plunge pool. Indulge in the pinnacle of luxury and space with spectacular sea views from your 200 square metre suite. Refresh in your seaside pool or recline on the daybed of your sala, set in a large and private tropical garden. Presenting romantic seclusion by a picturesque lagoon, 140 square metres of tropical bliss features an al fresco terrace, sala and exotic outdoor shower, leading into an interior of sophisticated Thai style. A unique two storey design of 180 square metres, surrounded by high walls with an antique wooden entrance, treats you to open air living space, a lush garden with plunge pool, and a bedroom with a constant sea breeze. The ultimate beachfront hideaway spans an impressive 260 square metres. Soak in the large terrazzo tub of the open air bathroom, enjoy tropical relaxation in a garden sala and plunge into your shoreline pool. Rates are incl. 10% service charge, incl. 7% VAT, incl. breakfast for 2 people. Maximum occupancy 3, 2adult and 1 child. Rasananda is an idea destination for a romantic gateway, thus we do not provide any children facilities eg. baby cot, kid menu etc. Checkout Time is 12:00 noon. Room used from 12:00 noon until 6:00 p.m. on the day of the departure will be charged 50%. Room occupied after 6:00 p.m. will be charged 1 night. Check in Time at 2:00 p.m. Ground Transfer from Thongsala Pier or Haad Rin Pier to Resort is 3,000THB for a private limousine service with Guide. Max 3 persons. Samui Airport To Resort including Ground Transfer in Samui (Samui Airport, Chaweng and Bang Rak. Other area surcharge at 1,000- 2,000THB per car) and speed boat service to Phangan is 3,500 THB/person, 1,750 THB/child. If speed boat service is unavailable, the round trip transfer from Samui Airport to Resort will be 2,500 THB/person and sea crossing will be by ferry inclusive. Children 2 years or under are free. 2+ are full price. Private Speed Boat transfer on Ultimate Bliss - 12,000 THB each way or 20,000 THB round trip per boat max party of 8 persons. Should Weather prevent transfer by speedboat, an alternative will be arranged via public catamaran or ferry. Peak Season 24 DEC - 5 JAN 2013 requires a compulsory 5-night stay. Compulsory Gala Dinner, Christmas Eve 24 Dec 12 @ 5,500 THB/adult, 3,500 THB/child. Compulsory Gala Dinner, New Year's Eve 31 Dec 12 @ 8,000 THB/adult, 5,000 THB/child.